1. Fry the onions in a little oil in a large pot for about 5 minutes, or until soft. 2. While the onions are cooking, crush the coriander and cumin seeds together with the coriander stems using a mortar and pestle. 3. Add the garlic and the crushed seeds to the onion. Stir over the heat for a minute or two until things start to get fragrant. Now add the mince. Stir through with the heat under the pot to brown the meat a little. 4. Scrape the mince back from one side of the pot and moving that side directly over the flame, tilt the pan towards that side and pour in the vinegar. Let it bubble away with the juices that flow from the meat for a minute. Now stir it in with the chilli flakes and the oregano (or epazote if you are using it). 5. Add the cinnamon stick, the tomatoes, a pinkie-sized strip of orange zest, the beef stock and half the beans. Stir and break up the tomatoes if needed. Bring to the boil and then reduce to the merest bubble on a low heat for a couple of hours, stirring every so often when you pass the stove. 6. Let the pan cool and place overnight in the fridge to let the flavour develop. An hour before you want to eat, pop the potatoes into a preheated 180°C oven to bake. 7. Put the chilli back on the stove and bring to the boil. Add the remaining beans and the diced red chillies. Boil for a couple of minutes and then reduce to a simmer until you want to eat. Lay the 4 long green chillies on top of the chilli and leave them there to soften. 8. 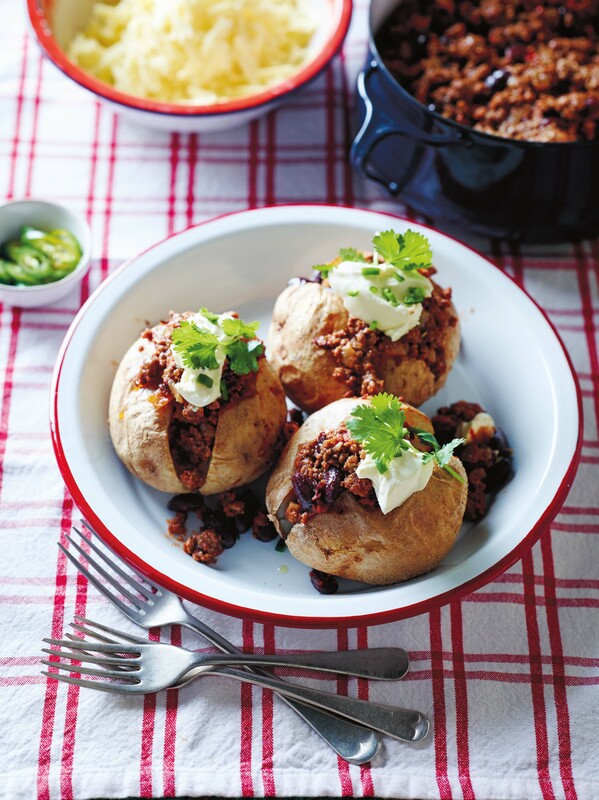 Remove the potatoes when soft and serve, split in half, filled with chilli and topped with a dollop of sour cream. 9. Garnish with grated orange zest and coriander leaves. Serve with a bowl of grated cheese and a bowl of the finely sliced green chilli on the side. This recipe appears in Cook Book by Matt Preston, available now from Pan Macmillan.